At Bissel Catering we offer a variety of catering menu options to satisfy your every need, desire and taste. 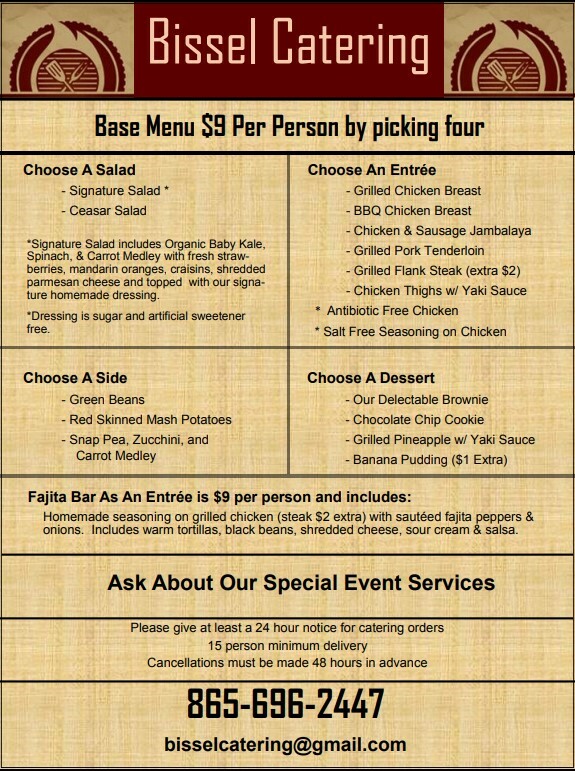 We take pride in building each menu specifically for your unique events. We offer a unique range of delicious catering options that are sure to be a hit for any occasion. From classic steak and shrimp delights, to fajita bars and burgers, the options for your dining experience are endless! Our appetizer menu offers a variety of savory hors d'oeuvres and flavorful finger foods that range from simple to extravagant. One of our specialties include sumptuous salads with organic ingredients such as fresh spinach, kale, sweet strawberries, and so much more! Make sure your guests are satisfied at the end of your event or wedding. We have a variety of delicious options to choose from such as tenderly grilled chicken varieties, savory steaks and pork tenderloin. All our entrees are prepared from gourmet recipes and with high-quality ingredients. And don't forget about our sides. We pair them beautifully with our entrees that include select favorites like green beans and mouthwatering red skinned mash potatoes. End your meal with a decadent treat that will leave an impression to remember. Every dessert is ingeniously prepared giving a full-flavored experience with every bite. Our dessert menu has an assortment of delectable brownies, classic chocolate chip cookies and even grilled pineapple with yaki sauce! Talk about delicious! Our savory desserts are the perfect way to end your night and is sure to be a hit with your guests!